Demi Lovato handles it like a trooper after belly flopping on stage in LA. Demi Lovato just proved you can’t keep a good woman down. The 22-year-old star slipped and fell Sunday at KIIS FM’s “Cool For The Summer” Pool Party at the WaterMarke Tower high-rise in downtown Los Angeles. Pictures from the party showed fans clearly having a good time. But the “Heart Attack” singer nearly gave the crowd a heart attack when she slipped, landing flat on her stomach. 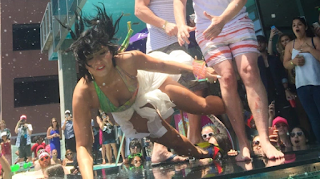 Things went awry as Lovato — dressed in a colorful swimsuit and matching platform heels — decided to take a plunge in the pool. As she went in for the dive, something went wrong and she came in for a hard landing. 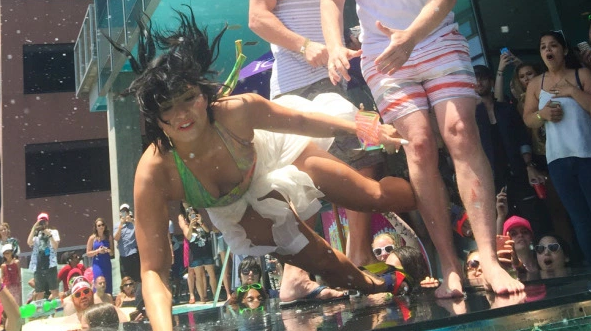 Watch the video of Lovato’s belly flop below.